*Age 3 to 5, Cycle 2, 2009/11 only. Source: CICH graphic created using data adapted from Statistics Canada. Canadian Health Measures Survey. Data underlying the Figure combines Cycles 1 (2007/09) and 2 (2009/11) – custom runs. According to the Canadian Health Measures Survey (2007/2009 and 2009/2011), 6% of children 3 to 5 years of age are exposed to environmental tobacco smoke in their homes every day or almost every day. 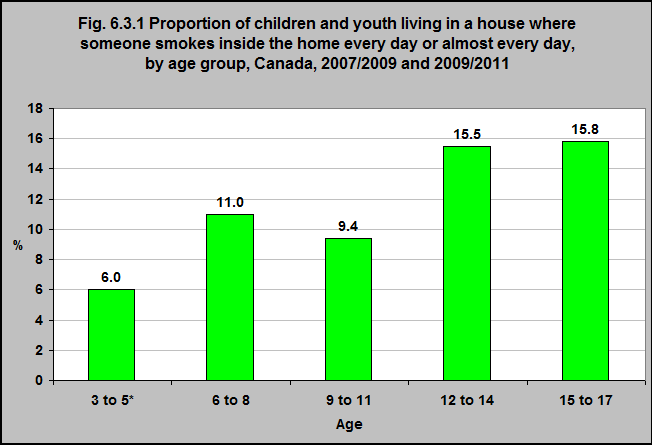 That proportion was higher for older Canadian children and youth.